World Breaker costs seven mana. Turns out that helps to make it pretty cool. 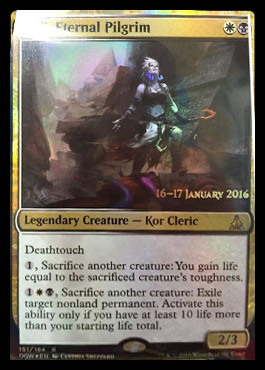 Let us consider two different (rumored) Eldrazi giants from the upcoming Magic: The Gathering set Oath of the Gatewatch. … And it does all kinds of other stuff at the same time. World Breaker generates card advantage the turn it comes into play. It is a kind of a Creeping Mold. 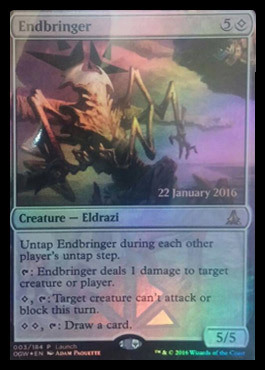 Imagine, for instance, the advantage you would have playing the first World Breaker in an Eldrazi mirror match! 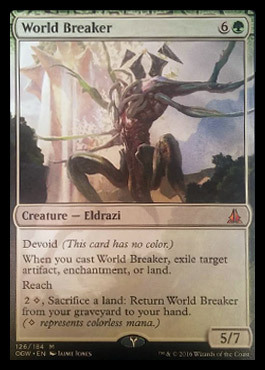 Decks with an excess of lands can find World Breaker after World Breaker (and Eldrazi decks will often have an overabundance of lands in play). And the Reach even means something! 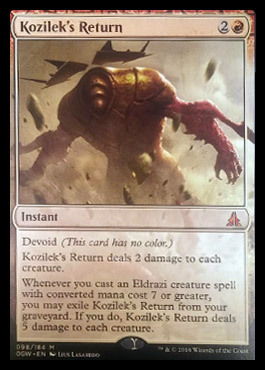 Eldrazi players might find themselves beaten up by Mantis Riders or Thunderbreak Regents early on… World Breaker can help defend against those opponents. If it lives for several turns you can certainly accumulate a nice amount of card advantage. 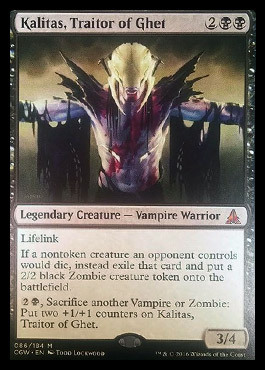 Endbringer is a card with no evasion, no inherent protection, and doesn’t generate card advantage the turn it comes into play. Certainly it can generate card advantage over time… But it asks for a lot of room before you can get there. Michael and Patrick debate the finer points of World Breaker and Endbringer; love on Kozilek’s Return, and speculate generally on Oath of the Gatewatch’s rumored upcoming tools in “World Breaker is Hot; Endbringer is Not”. 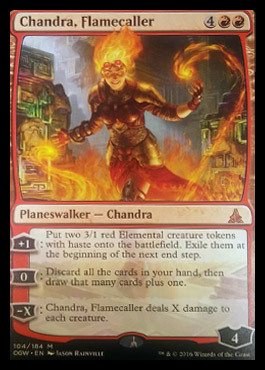 Chandra, Flamecaller is a rumored new Planeswalker from Oath of the Gatewatch. There is already precedent for a six mana Planeswalker with the ability to sweep the board (and stick around) in Elspeth, Sun’s Champion (Patrick even won a Pro Tour using that Planeswalker); Chandra fits that minimum bill. [-x] At her absolute worst, Chandra’s [-x] ability is a “Savage Twister” for four damage at 4RR… Which combined with any amount of versatility at least gets her in the conversation. If you have four toughness creatures and can just “Slagstorm” leaving Chandra, Flamecaller on the battlefield that can help create a massive advantage on the board. Chandra’s “zero” ability is just card advantage. If you have no cards in hand, this  gives you a net one card… And if you have any number of cards in hand, the ability becomes extraordinarily powerful. Once you have any number of cards in hand you can start to fuel Delve spells like Murderous Cut, set up creatures like Deathmist Raptor and Den Protector, or enable completely new (or rather, rediscovered) color combinations in Standard. [+1] Mike initially thought this was the least interesting ability, but Patrick predicts that the “attack for six with haste” ability is the money ability on Chandra, Flamecaller. We were already (probably) happy to play Chandra for her sweep and card advantage abilities… But she can quickly close out a game, too! Patrick and Michael believe that Chandra, Flamecaller will be an exciting and highly played new Planeswalker via Oath of the Gatewatch… But take a good (and pretty entertaining and analytical) hour to get there. The cool thing about Chandra is that she is such a powerful card that we will see her both incorporated in existing archetypes and as the centerpiece of all new decks! Find out which in “Chandra, Flamecaller Analysis”. … Or what weird angle (and what abilities) Mike concentrates on with his initial analysis. Michael and Patrick don’t focus on Abzan for too-too long… There are just too many sweet decks to talk about! Ali played “an Eldrazi deck with no actual Eldrazi” … And boy is this deck sweet! The most interesting card in his deck (or at least the least intuitive) is Gather the Pack. Gather the Pack is most commonly played in decks with high concentrations of creatures; here Ali played it in a deck with only thirteen creatures. 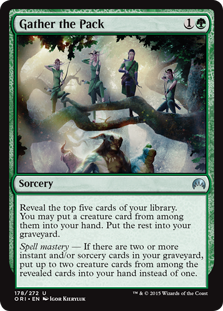 In this deck, Gather the Pack — when it hits — will often get a powerful planeswalker like Jace, Vryn’s Prodigy or Nissa, Vastwood Seer… But even when it wiffs, it helps to set up Dig Through Time or Nissa’s Pilgrimage (due to Spell Mastery). There are lots of super cool deck lists in this episode, plus the return of the Transformers transformation sound; because, you know, Hasbro cross-branding.